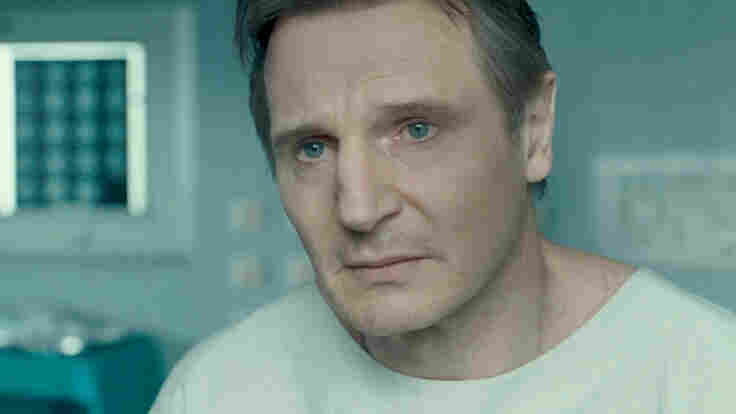 Movie Reviews - 'Unknown' - In Liam Neeson Thriller, Too Much Undiscovered An academic wakes from a coma to discover another has taken his identity. 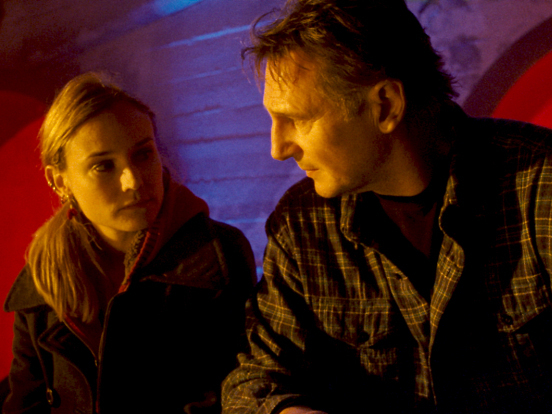 Liam Neeson's slow-burning sincerity is an asset, but the plot's full of holes — and the director's full of hooey. PG-13 for some intense sequences of violence and action, and brief sexual content. Who would expect botanists to lead such exciting lives? The writers of Unknown, that's who, though after watching this excessively contrived, weirdly becalmed thriller from Spanish director Jaume Collet-Serra (Orphan) — yet another refugee from music videos and TV commercials — audiences might beg to differ. The plant lover (or is he?) at the center of this Berlin-based brouhaha is Martin Harris (Liam Neeson), who arrives in the snowy city with willowy wife Elizabeth (January Jones) to deliver a paper at a biotech conference. Things go awry almost immediately, when a bid to retrieve lost luggage leaves Martin half-drowned and three-quarters amnesiac. Awaking from a four-day coma without phone or papers (it's Thanksgiving, so good luck raising the American Embassy), Martin checks himself out of the hospital and into an existential nightmare. His hotel won't admit him, his stateside colleagues are unreachable, and his wife is living it up at a cocktail party with a man (Aidan Quinn) who claims to be her husband. Compounding Martin's misery are two assassins (one of whom bears an uncanny resemblance to Vincent Gallo) who keep popping up to try whacking him whenever he gets close to remembering anything important — or the audience gets close to nodding off. Working from Didier van Cauwelaert's novel Out of My Head, writers Oliver Butcher and Stephen Cornwell strain for Bourne Identity-style excitement, littering Martin's path with helpful females — a sympathetic nurse (Eva Lobau), a spunky Bosnian illegal (Diane Kruger) — and various mysteriously skulking males. But though cinematographer Flavio Labiano turns the city into an alien maze of steel and glass (melding perfectly with the scenes filmed at the Leipzig/Halle airport), his chilling work is undercut by a script with more logical craters than Martin's mangled memory. Harris finds an ally in Gina (Diane Kruger), an undocumented Bosnian immigrant, after Berlin authorities don't believe his story. Viewers exceeding the age limit for Justin Bieber's fan club may remember the excellent 1995-1996 TV series Nowhere Man, starring Bruce Greenwood as a photojournalist whose entire life is erased in the course of a single evening. Unknown takes its hero on a rather different journey, but Neeson, like Greenwood, possesses the slow-burning sincerity of a smart man coping with atypical befuddlement and a brain that can no longer be trusted. With his loping gait and prizefighter mug (albeit sadly smoothed out), he navigates the thriller landscape — here strewn with spectacular car chases and mangled taxicabs — with more credibility than most. Yet Neeson's comforting intelligence (and a marvelous turn by Bruno Ganz as an ailing former member of the East German secret police), are not enough to prevent the film from choking on obviousness and directorial fumbling. A swirling museum scene featuring blown-up photographs of unidentified faces — which in the hands of Brian De Palma could have been delicious — is almost laughable in its complete lack of subtlety. Merging modern global concerns with the timeless tropes of the generic spy thriller, Unknown, with its anti-corporate thrust and philanthropic conclusion, could have been sophisticated entertainment. But that would have required, at the very least, the addition of imaginative writers and the expunging of Jones' catwalk-and-Quaaludes performance. So far, not even Mad Men has succeeded in achieving the latter.